Honour Shield of Duke Wenceslas - 1st Class, 2nd Class, 3rd Class. Rarity - Extreemly Rare, Very Rare, Very Rare. Honour Shield of Duke Wenceslas - Third class. Honour Shield of Duke Wenceslas - Third class - reverse. Honour Shield of Duke Wenceslas - Third class - Minature. Honour Shield of Duke Wenceslas - Third class - Minature - reverse. Honour Shield of Duke Wenceslas - First class Miniature. Honour Shield of Duke Wenceslas - First class Miniature- reverce. 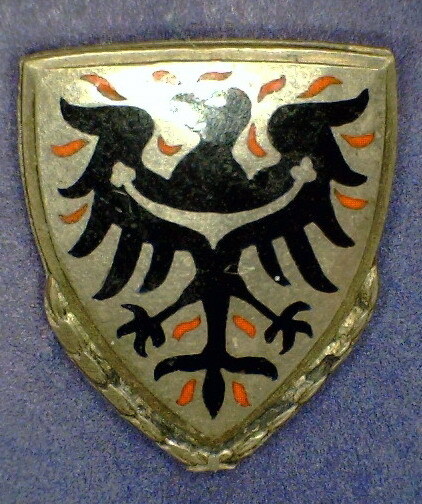 The shield is awarded in three classes and produced in two sizes. 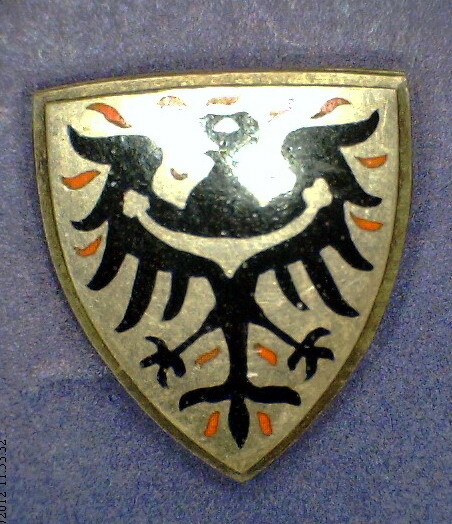 These correspond to the German Golden Party Badge and are similarly, in the case of the larger one, to be worn on the military or party uniform. 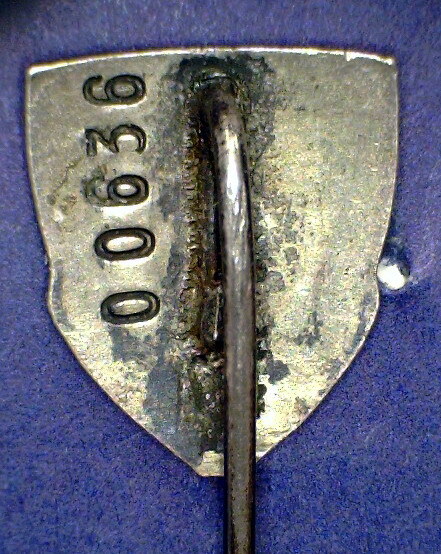 This measures 25 mm by 22 mm, while the smaller badge was to be worn on the civilian dress and measures 17 mm by 15 mm. The three classes of the shield all take the same design employed in the lowest class and comprise of a pointed shield which has a top with sloping shoulders. The outer border of the shield has chamfered edges and the body is also curved vertically. The badges are produced from silver with their obverse being highly polished. This has an eagle surrounded by tongues of flame routed into its surface. The eagle is infilled with black enamel while the tongues of flame are finished in red. These are polished flush to the body of the shield. This eagle flambé of St. Wenceslas is one of the most ancient heraldic devices in Europe and first appeared on the Seal of Bohemia in 1192 AD, with the first coloured version appearing in 1312 AD. The First and Second Classes have the addition of a laurel wreath running up the sides of the shield. This comprises of a small tie at the point and six bunches of three leaves on either side. In the Second Class these are silver, while in the First Class they are gilded. The sizes of the large and small badges are increased to 27 mm by 22 mm in the large badge and 18 mm by 15 mm in the small. The reverses of the large badges have a plain matt silver finish. There is a round hinge through which is placed a small wire pivot to attach a needle pin and a broad 'C' form hook that is soldered directly to the reverse. 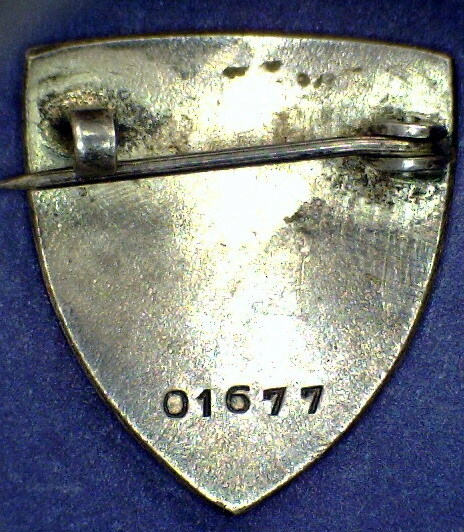 Stamped into the bottom of the shield is a five digit number in a horizontal line. The reverses of the small badges are again matt silver, with a needle pin that is soldered into a recess and is somewhat reminiscent of an extruded paperclip, similar to that encountered to the Oak Leaves attaching them to the Knights Cross of the Iron Cross. 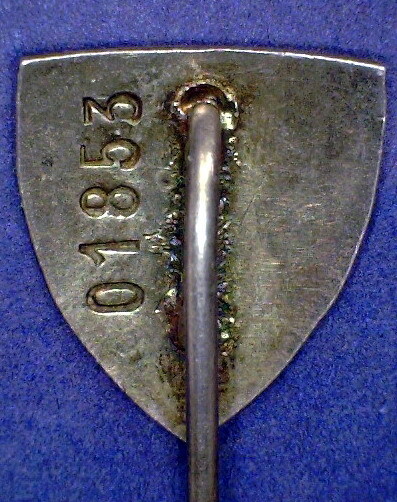 In this case, one arm is cut short and the other is left longer, forming the pin. On the left-hand side is found a five digit number but stamped in larger numerals in this case. These numerals run vertically. The numbers so far encountered, on both sizes, are; 00521, 00636, 00884, 01308, 01677, 01821 and 01853. Whether or not this is the issue number of the badge or a party number is unclear but I assume that they relate to the actual issue number of the badge. 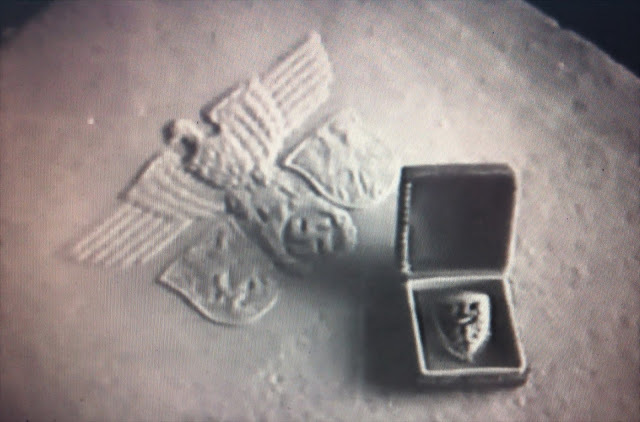 To reward the citizens of the Protectorate who rendered loyal service to the German authorities, Karl-Hermann Frank instituted this badge on 6 June 1943 to commemorate the first anniversary of the assassination of Reinhard Heydrich. Duke Wenceslas of Bohemia lived from 908-929 AD and concluded a treaty of friendship with the Saxon King 'Henry the Fowler', placing Bohemia under German protection. He was therefore seen as the symbol of the alliance between Bohemia and Germany. Henry I was one of Himmler's idols and was to reach the heights of eminence by becoming the Holy Roman Emperor. While, on the other hand, Wenceslas was to pay the ultimate price for his collaboration by being murdered by his own brother. 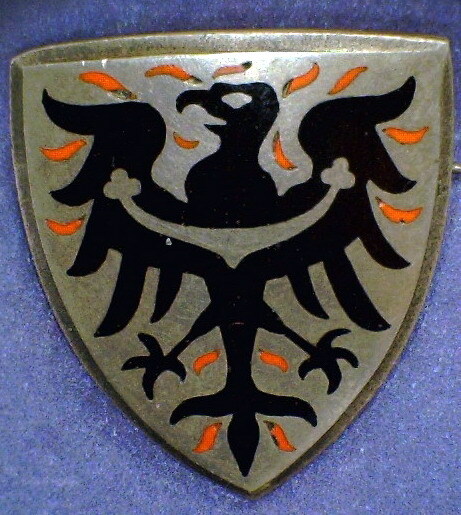 The first awards of the shield were made by Karl-Hermann Frank on 18 June 1944. The Criteria for the award is unknown. The box that held the large badge is unknown, while that employed for the small one consists of an oblong hard case that has a hinge formed from the paper covering. This covering has a small squared design embossed all over the box. 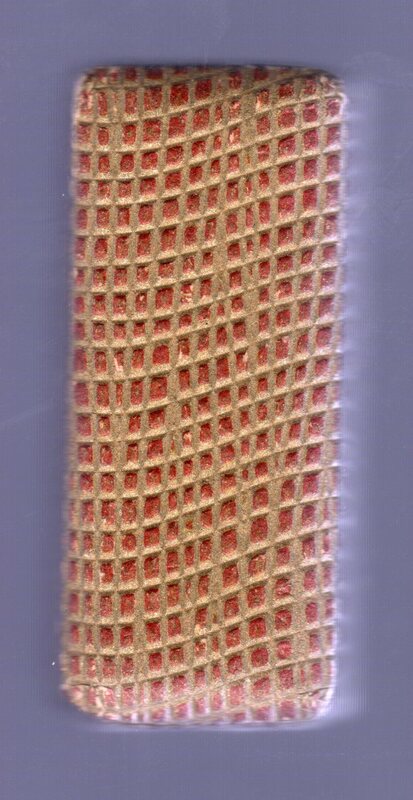 This covering is a bright brick-red and the embossed lines are gold leaf. The inner lid lining is a separate red cotton plate stuck to the underside of the lid and the lower pad has a similar cotton covering with a large central slit to accommodate the pin. Honour Shield of Duke Wenceslas - Third class - Minature - Case. 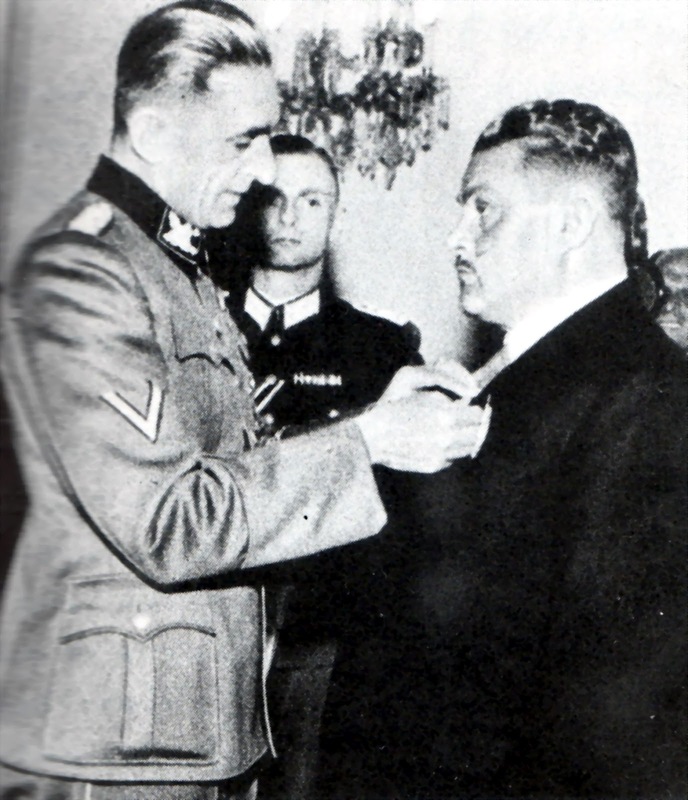 Karl Hermann Frank awards the first "Shield of Honour of the Protectorate" on 18th June 1944. The investiture of the award.